DID YOU KNOW AN OPHTHALMOLOGIST DISCOVERED BOTOX FOR COSMETIC USE? Today’s trendy “Age defier” Botox injections have been used by ophthalmologists for over 30 years to treat muscle problems of the eye area. Those patients soon realized their facial lines and wrinkles “disappear”. The FDA agreed! And we’re taking what we know to the next level. Most of us would rather not be reminded of the distance we have traveled. As we age, we begin to notice the vertical “frown lines” between our eyebrows, the horizontal forehead creases (Referred fondly by Dr. Romanoff as “Atlantic Ocean”), or perhaps “crow’s feet” (smile lines) stretching from the corners of your eyes. Botox is an effective way to relax the dynamic muscles we contract when we smile, frown or make facial movements. Tiny amount of the product is injected into the facial muscles that cause these wrinkles. The chemical that causes the muscles to contract are then blocked so that the muscles relax and the wrinkles subsequently smooth out. Injections do not prevent the ability to smile or show expressions. Botox has been proven safe for wide range of candidates between the ages of 18-70 who would like to improve the appearance of frown lines, crow’s feet and forehead furrows. A very large number of people seeking treatment find they are excellent candidates. Studies have shown that Botox can also be effective in relieving migraine headaches. Sixty percent of patients reported marked relief of migraines after treatment. Talk with one of our staff members to find out if you are eligible for health insurance coverage for this procedure. This treatment is quick and minimally invasive non-surgical procedure offering dramatic results that are noticeable within three to seven days. In clinical trials, nearly 90% of men and women surveyed rated the improvement in appearance as better than expected one month after treatment. 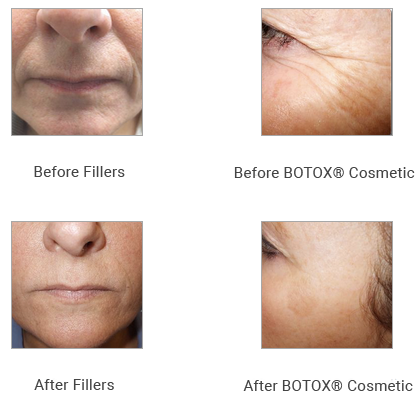 Many patients saw their facial lines “disappear”. Dr. Romanoff administers all injectable treatments himself. Patients can rest assured that they are receiving their treatments from a board certified ophthalmologist who has in-depth knowledge of the facial muscles, tissue and nerves. Dr. Romanoff has restored youthful look to the faces of many Toledo, Sylvania, and Northwest Ohio women and men with Botox Cosmetic treatments.